It’s the 15th century and an unholy fear is sweeping across the land. Man no longer fears death but welcomes it as an escape from the evil that has settled into his life. Mostly clouded in ignorance, many innocent people are put to death at the hands of the Inquisition. As this film begins, we do not find the innocent, but rather the guilty minions of the Dark Lord, who are being prepared to meet their maker. During that time Horror Rises from the Tomb was one of the movies that everyone was talking about. 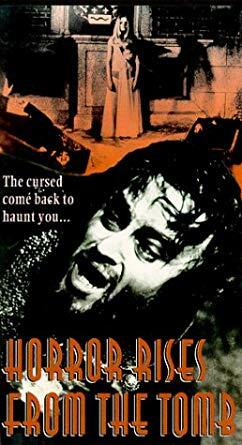 Ulric (Paul Naschy) and lovely wife (Cristina Suriani), an evil pair of sorcerers, have been condemned for their transgressions and now must pay the ultimate price with their lives. But before the executioner’s ax falls, Ulric pronounces a curse on his descendants and even the grave can’t stop him from seeking his revenge. Fast forward to the present. During a seance, an evil spirit convinces four youths to visit their ancestral home in search of a treasure. Inspired by the thoughts of ancient riches, the four (lead by Naschy as Hugo) begin a journey that leads them towards a rendezvous with an unspeakable evil for the treasure they seek is actually the head of Ulric and the price to be paid will be in the blood. Through a deadly chain of events, Ulric’s head is brought back to his body and his curse begins to take shape. A possessed local (Luis Ciges) serves as Ulric’s minion, who sickles his way through any obstacle that would prevent this evil from resurrecting his wife. Now reunited, the duo raises a zombie army of the dead to finish what was started centuries before. But will they be successful in reaping their timeless revenge on mankind by summoning the Dark Lord or will the grave reclaim them forever???? I can’t believe this is the first film of Paul Naschy to be covered in the House of Horrors. Although I have been a fan of Paul’s for years and even had the pleasure of meeting this legend at the Fangoria Convention in NYC (1998), I am just coming to expand my appreciation for his work. “Horror Rises from the Tomb” has it all: great atmosphere, solid storyline, gore galore ( one memorable scene includes a graphic skin- ripping and heart removal with implied eating… well, at least in the uncut version), and an eerie score. 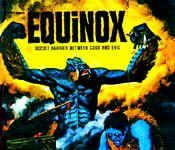 This is a great film and one of my favorites by Naschy. I hope to cover more Naschy films in the future including my favorite “The Craving” (aka “El Retorno del Hombre Lobo“).